Opened in 2015 on E. 7th St. in Austin, Texas by Ben Runkle and Bryan Butler, Salt & Time is a hands-on butcher shop that features a sit down restaurant and bar. 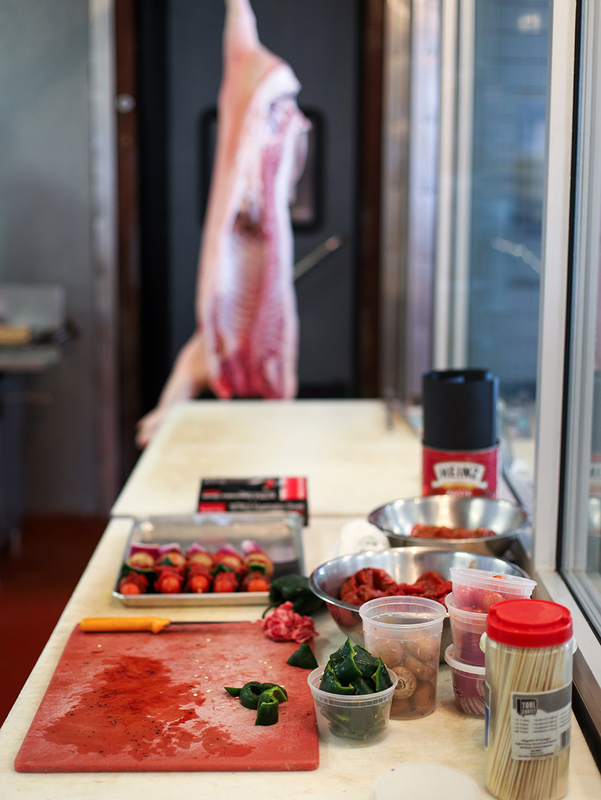 Behind the counter and cases with bright red Texas raised sirloin, chuck and chops is the cold room with a track mounted to the ceiling staggered with hooks – this is where the real action happens! On the day Jesse James Culinary visits for the Breaking, half carcass after half carcass of pork is delivered, hung by the trotter and slid through the cold room into the freezer. Bryan grabs the last pre-dressed carcass like a date on the dance floor, and holding the Pig Sticker in his right hand, he draws the blade in a circular movement around the neck, and cuts through the flesh to remove the head in one elegant movement. This is the first of four Primal cuts for a butcher. Rocking a chain-mail apron and metal scabbard loaded with knives, Bryan truly represents his trade in hard-core heavy metal fashion. For the second Primal cut to the shoulder, Bryan employs the Texas BBQ Special butcher’s knife. 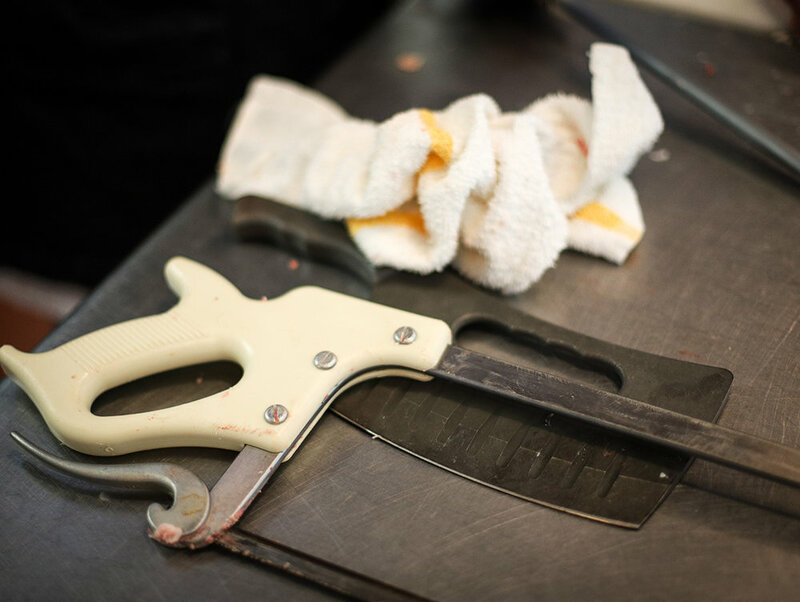 Next he removes the front trotters with the Pig Sticker, also known as the boning knife, and considered the most important knife to a butcher. 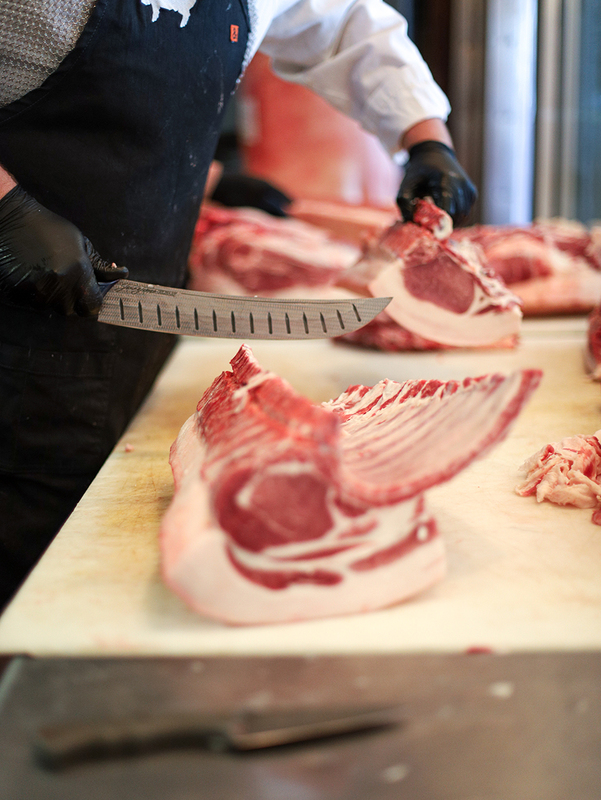 Bryan uses the Pig Sticker to cut #3, the middle cut, and is left with cut four hanging – the ham. 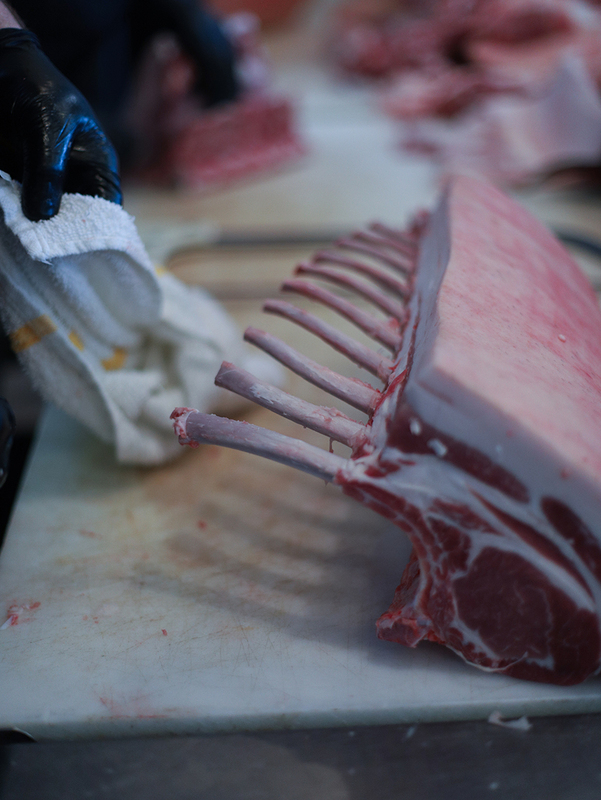 With the pork cut into Primals, Bryan starts to get to the finer work of cutting for chops, bacon and stock bones. Now we’ll see how our knives hold up with a pro. Bryan starts trimming the fat off his side of bacon with our butcher’s knife, then switches to the paring knife to pull through the fat with ease. For fun, he grabs the Mean Gein cleaver before switching to the more user-friendly hand saw to cut through the spine of the pork. We get to witness the skill and style with which Bryan tests the Pig Sticker on the pork ribs, to cut and dress the meat into a one inch thick, French styled chop he calls, The Slayer Chop. This piece of pork is as hot as the night in late June that Jesse took the Outlaw crew to the Circuit of the Americas Amphitheater to see Slayer, Lamb of God, Anthrax, Behemoth and Testament. Nothing like some classic heavy metal and a heavy dose of pyrotechnics to inspire the guys and gals at the garage, and a fitting tribute to Bryan’s massive cut of meat. The pork fat gets the Pig Sticker handle slippery. The edge of the blade nicks him, and seasoned to the risks of his trade, Bryan deadpans, “sometimes you gotta give a little back.” Getting cut has never seemed so cool. I’m shivering as Bryan shows us a butcher’s trick where he removes the hip at the joint by the ball socket that is fused in younger animals; he is seam butchering, a practice that is essentially intuitive. Bryan puts his hands inside the flesh to feel the muscle, pulls it back and uses the knife to cut “seams” in short movements, as well as in long sweeping cuts. Bryan the butcher is a true master of meat. He makes cutting the head off a pig look as easy as peeling Bologna. We’ve brought over the knives in different finishes, and Bryan tells us that he “loves the geometry” of the butcher’s knife and finds the Triple Black finish to be “really classy.” His preference is the stoned finish since it has a texture that offers better grip. 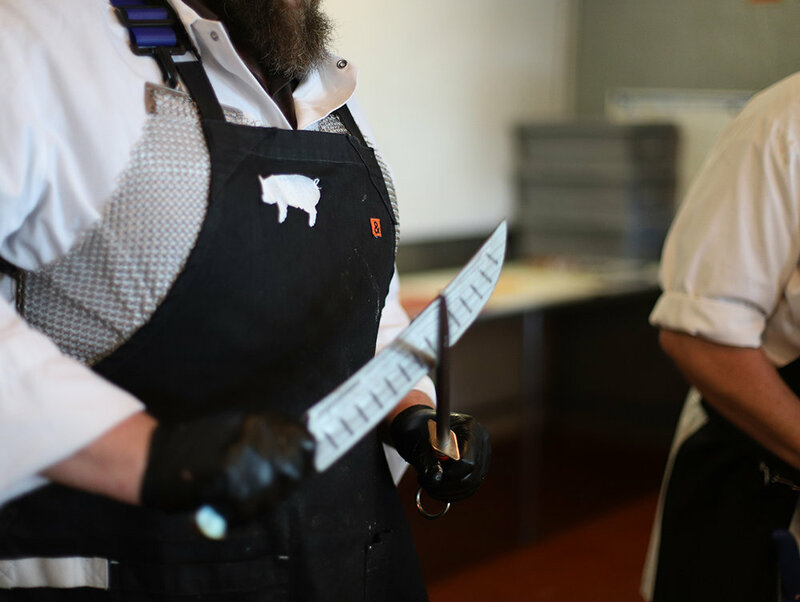 With the pork on the table, cut to sell, we present Bryan with the final test: which Jesse James Culinary knife does he want to keep for himself? The Pig Sticker paring knife, the Texas BBQ Special butcher knife, the Mean Gein cleaver, the Niner Chef’s knife or the Hassan Chop Santuko? Seconds pass, and Bryan Butler, butcher extraordinaire and self-proclaimed “knife geek” chooses the Texas BBQ Butcher’s for keeps.